The Equus 3140 Innova Dignostic Code Scanner is an enhanced scan tool that is loaded with many professional features. If you are new to diagnostic scanners, this handy tool connects to your vehicle, scans various parts of your car, truck or SUV, and retrieves a list of diagnostic trouble codes (DTCs) and code definitions from your vehicle's computer. But even if you're a veteran to scanners and auto repair, you'll be impressed with the new functionality that Equus has added to the 3140. This device not only scans your vehicle, it also allows you to freeze-frame live timing and pinpoint your vehicle's problem. Instead of having to recreate a scenario over and over again, you can now playback the timing to scrutinize all the data and make a clear diagnosis. Combine this with Internet connectivity and the ability to interface with a PC, and you have a powerful, professional diagnostic scanner in the palm of your hand. As government agencies establish more stringent emission laws, vehicles continue to become more sophisticated for maintenance and repairs, forcing professional mechanics, DIYers, and consumers alike to find easy-to-use tools for diagnosing their vehicles. Many tools have already been developed to access these powerful on-board vehicle computers, but the Equus tool is particularly simple to use and surprisingly affordable. It is designed to be used by almost anyone, from the weekend mechanic to the ASE master technician. 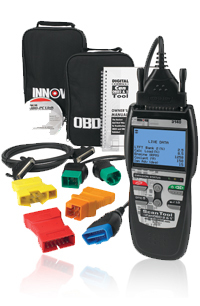 The 3140 Diagnostic Code Scanner can retrieve diagnostic codes in all OBD II (1996 and newer) and some of the most popular OBD I (1982 to 1995) vehicles. The scanner features a unique, patented all-in-one LCD screen that shows 25 parameters at once without the need to scroll through time consuming menus. Separate LED indicators located below the screen provide quick OBD I/M emissions checks; so you'll know if you're ready to pass those ever-increasingly stringent laws. Equus built the 3140 to display on-screen DTC definitions and user interfaces in English, Spanish, or French, and the trilingual language selection is accessed via a simple menu command. 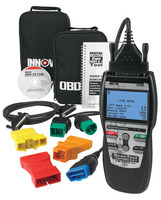 This device can store diagnostic codes in its memory for off-car review and analysis. Additionally, you can connect the 3140 to your PC with the included cables and software to generate, print, and save detailed diagnostic reports--and even update the scanner via the Internet. The 3140 links to all OBD II protocols including CAN (Controller Area Network). The tool captures and displays freeze frame data that will help you pinpoint and troubleshoot any problem. This device is equipped to retrieve the following OBD II diagnostic trouble codes (DTCs): Generic Codes (P0, P2, P3, and U0) and Manufacturer Specific Codes (P1, P3, and U1). In addition, the tool provides live data (view, record, and playback live PCM data streams), bi-directional testing, vehicle ID capture, and O2 sensor results. Equus Products, Inc. ("Equus") warrants to the original purchaser that its units are free of defects in materials and workmanship under normal use and maintenance for a period of one (1) year from the date of original purchase. Equus Products, Inc., is an ISO 9001: 2008 certified company, and a leading manufacturer and distributor of test equipment, gauges and tachometers for the automotive aftermarket. Founded in 1982, the company markets and distributes its gauge line under the Equus brand to major retail and WD accounts throughout the US, Canada and Mexico. In 1990, Innova Electronics Corporation was acquired for research, design and product development. Test and tune-up products developed under this division carry the Innova brand, providing customers with easy-to-use products for servicing the vehicles of today and tomorrow.